GEN. SAMUEL MCCONIHE, fourth son of Hon. Isaac McConihe and Sarah (Strong) McConihe, of Troy, N.Y., was born at Merrimac, N.H., Sept. 8, 1836, in the old family mansion of the McConihes. He was fitted for college in Troy, N.Y., his place of residence, and graduated at Union College, in 1856. He had chosen as his profession that of the law, but when the Rebellion broke out in 1861, fired with patriotism, he flew to the service of his country, raised a company of infantry, and was appointed captain of it December 3rd of the same year. His regiment, the 93rd Volunteers, remained in barracks at Albany, N.Y., about four months, and afterwards encamped at Washington, D.C., nearly two months. On the 30th day of March, 1862, he embarked, and April 1st arrived with his regiment at Fortress Monroe; participated in many skirmishes and reconnoissances near Lee's Mills and in front of Yorktown. May 4th, 1862, he marched with the Army of the Peninsula, and was engaged with the enemy at the battle of Williamsburg, Va., May 21, 1862. His company (Co. K) and Companies A, F, and H, were detached from the regiment to serve as general headquarters' guard at army headquarters. Served in this capacity and marched with the army up the Peninsula to Harrison's Landing, and afterwards back again to Fort Monroe. There he embarked and sailed to Aquia Creek, afterwards to Alexandria, and marched to Washington, and thence through Maryland, being engaged with the enemy at Antietam. Afterwards he marched to Falmouth, Va.; was engaged in the battle of Fredericksburg and Chancellorsville, and afterwards marched through Maryland and Pennsylvania to Gettysburg. July 19, 1863, was detached from the regiment and placed in command of his own company and Co. H, and ordered to report to Brig.-Gen. M.R. Patrick, Provost-Marshal-General Army of the Potomac; he was assigned to duty guarding general and rebel prisoners, and furnished all the guards required at the provost-marshal-general's headquarters. Served in this capacity and marched with the army to Germantown and Culpepper C. H., thence to Mine Run, and back to Fairfax Station. Dec. 3, 1863, he was promoted to the rank of major, and rejoined his regiment December 28th. Seven companies of his regiment re-enlisted and received furloughs. He remained in command of the three companies, numbering about three hundred men, and performed the guard duty both at army headquarters and the headquarters of the provost-marshal-general. April 20, 1864, his regiment was assigned to the 2nd Brigade, 3rd Division, 2nd Army Corps, and he marched with the army from Brandy Station to the Wilderness, Spottsylvania, Cold Harbor, and Petersburg, and participated in all the battles. When about to go into action at Cold Harbor he was met by the chaplain of the 169th Regiment, bearing the dead body of his brother, Col. John McConihe, who had been shot and instantly killed by the enemy a few moments before, while in command of his regiment, the 169th. The long line of officers and soldiers in the rear paused for a few moments in their march to battle and to death while Col. Samuel McConihe dismounted from his horse to view the remains of his beloved brother, his constant companion in youth, his unselfish friend in maturer years. The scene was most affecting. His grief was irrepressible, and from the eyes of many a stalwart soldier long accustomed to scenes of sadness and horror flowed tears of sorrow and sympathy. Dec. 17, 1864, "Samuel McConihe was commissioned colonel of the 93rd Regiment New York Volunteers, vice John S. Crocker, resigned." Feb. 15, 1865, he was mustered out by reason of expiration of term of office, having served three years and three months. He was constantly on duty in the field, and was in every engagement (except one) in which his regiment participated. At the Wilderness he was in command of his regiment soon after the battle opened on the first day, the colonel (Crocker) being placed in command of the brigade, the brigade commander (Gen. Hays) having been killed at the commencement of the battle, and the lieutenant-colonel being absent. His regiment suffered severely, both in officers and men, but stood their ground manfully during both days' fighting, and received a complimentary order from Maj-Gen. Birney, commanding 3rd Division, 2nd Army Corps, for its gallantry and good conduct. He was in command of his regiment most of the time from the battle of the Wilderness down to Petersburg. The following are the names of the battles in which he has been engaged in their order: Yorktown, Williamsburg, Antietam, Fredericksburg, Chancellorsville, Wilderness, Spottsylvania, North Anna, Tolopotomy, Cold Harbor, Strawberry Plains, Deep Bottom, Poplar Spring Church, Petersburg, Boydton Road (1st), Hatcher's Run, Boydton Road (2nd), - seventeen in all. Captain 93rd Regiment New York Volunteers, Dec. 3, 1861; major, Nov. 3, 1863; colonel, Dec. 17, 1864; brevet brigadier-general of volunteers, April 8, 1864. 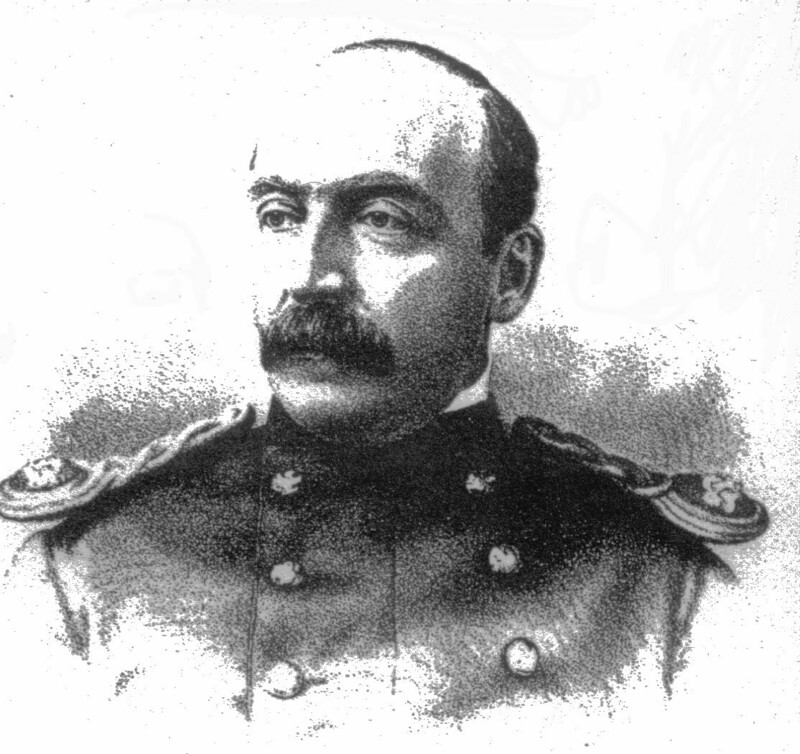 Captain United Stated Army, Feb. 25, 1876. Gen. Samuel McConihe is a man of the fine physique; a conscientious, brave, and ambitious officer. He has been stationed at various forts in the Eastern States as well as in the new States and Territories of Arizona, California, Wyoming, Utah, etc. He is now in the field in the war with the Ute Indians. In a letter lately received by his mother, he says they suffer severely by the cold during the march, and adds, "He who thinks that the life of an army officer is one of ease should be subjected to some of the hardships and dangers through which I have passed while in the service of my country."